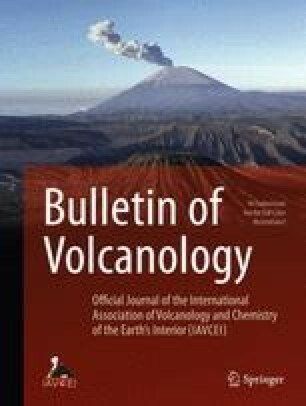 The majority of tephra generated during the paroxysmal 1883 eruption of Krakatau volcano, Indonesia, was deposited in the sea within a 15-km radius of the caldera. Two syneruptive pyroclastic facies have been recovered in SCUBA cores which sampled the 1883 subaqueous pyroclastic deposit. The most commonly recovered facies is a massive textured, poorly sorted mixture of pumice and lithic lapilli-to-block-sized fragments set in a silty to sandy ash matrix. This facies is indistinguishable from the 1883 subaerial pyroclastic flow deposits preserved on the Krakatau islands on the basis of grain size and component abundances. A less common facies consists of well-sorted, planarlaminated to low-angle cross-bedded, vitric-enriched silty ash. Entrance of subaerial pyroclastic flows into the sea resulted in subaqueous deposition of the massive facies primarily by deceleration and sinking of highly concentrated, deflated components of pyroclastic flows as they traveled over water. The basal component of the deposit suggests no mixing with seawater as inferred from retention of the fine ash fraction, high temperature of emplacement, and lack of traction structures, and no significant hydraulic sorting of components. The laminated facies was most likely deposited from low-concentration pyroclastic density currents generated by shear along the boundary between the submarine pyroclastic flows and seawater. The Krakatau deposits are the first well-documented example of true submarine pyroclastic flow deposition from a modern eruption, and thus constitute an important analog for the interpretation of ancient sequences where subaqueous deposition has been inferred based on the facies characteristics of encapsulating sedimentary sequences.